I don’t usually write “listicles.” They are not my favorite type of article. But they do have a place and this one is a great way for me to share my favorite places in Sicily. 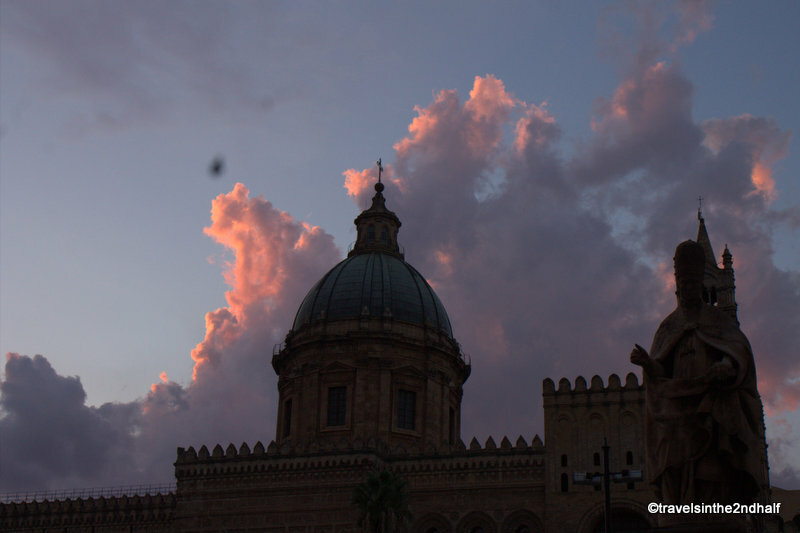 We could not have found a better place to stay in Palermo. This duplex is across Corso Vitorrio Emmanuele from Palermo’s beautiful cathedral. The apartment has two bedrooms and two full baths. On the bottom floor, the bedroom is a queen size sofa bed with an en-suite bathroom. There is also a kitchenette/dining/living room. Upstairs is the main bedroom, a second full bath and a living/work area. 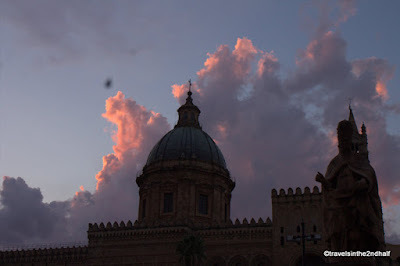 In addition to being a wonderful place to stay, this apartment is located exactly where a visitor to Palermo would want to be, in the center of the old city. The Cathedral is across the street. The Porto Nuovo is two blocks away, and the Quattro Canti (Four Corners) is a short walk down one of the main streets – Corso Vitorrio Emmanuele. This street is home to over a dozen book stores, all of the souvenir stores you could want to visit, and many very good restaurants and cafes. 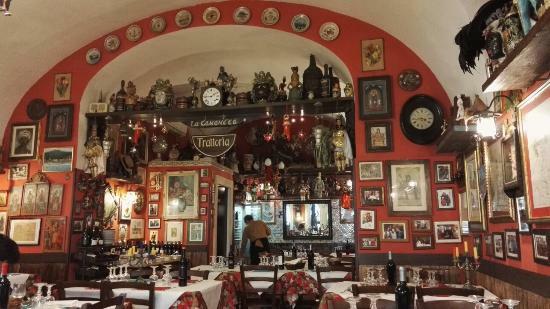 We ate at the Carlos V almost every night that we were in Palermo. There are other good restaurants, but this became our place, and we got to know the staff while they got to know us. The food was always fresh and the service was fast. I recommend the Pasta alla Norma, a Sicilian specialty, the Pasta alla Trapanese and two risotto dishes – with seafood and with vegetables. Carlos V sits out in the piazza, so it is a great place to enjoy the evening air and people watch. The Piazza Bologni is old and the buildings are beautiful. 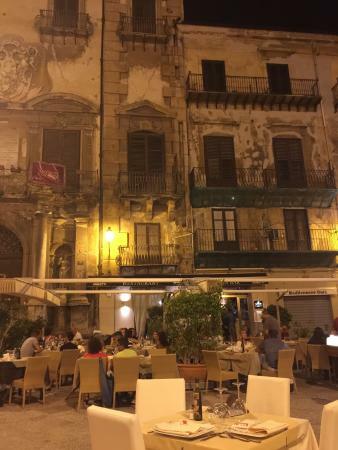 The chance to enjoy dinner in front of buildings that are hundreds of years old is a wonderful experience. This little hole in the wall place is a great lunch stop. Walk past the arancine and other fried goods in the front room and take a seat in the dining room. For €10 you get a full lunch – antipasti, main course and a non-alcoholic drink. The antipasti are flavorful, although mostly different eggplant dishes. The main courses, especially the sandwiches, are tasty, if not fancy. I would skip the fried goods in the front of the restaurant. There are better places for those in the markets. 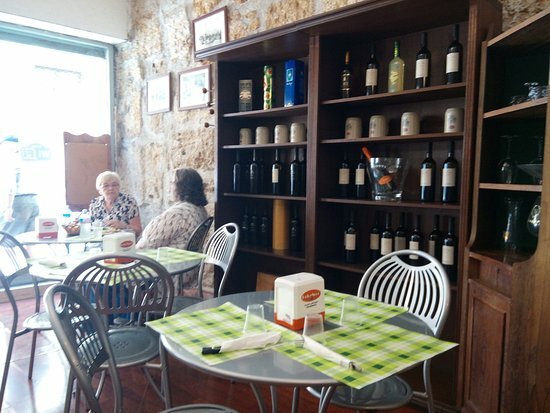 This little café, which is right outside the door of our apartment, is a great place to enjoy a coffee, a pastry or granita, and to watch the tour groups amble by, often in a daze. The busses discharge their throngs, and they pass literally through café, as the tables sit across the sidewalk from the café. This adorable little restaurant, around the corner from the cathedral, is a perfect spot for lunch or dinner. They have an excellent antipasti bar (for €7) and their pasta dishes are excellent. The Sicilian standards were all well prepared, especially the Pasta alla Norma and the Pasta with Clams. The restaurant also has the most interesting décor we saw in Sicily. The room is covered, from floor to ceiling with paintings, prints and tchotchkes. From Madonna and Child to Madonna and Betty Boop, Dagwood to Conquistadors, hundreds of statuettes line the walls and every available surface. Sitting on the corner of a modern building along the main drag of this part of town, this little café is a great place to stop in for a quick breakfast or snack. The coffee is excellent and the pastries are delightful. This Café is a dessert lover’s heaven. Located at the Piazza Università. They serve plates of food ordered at the counter. There are pasta, meat and vegetable choices, and you are charged by the size of your order. 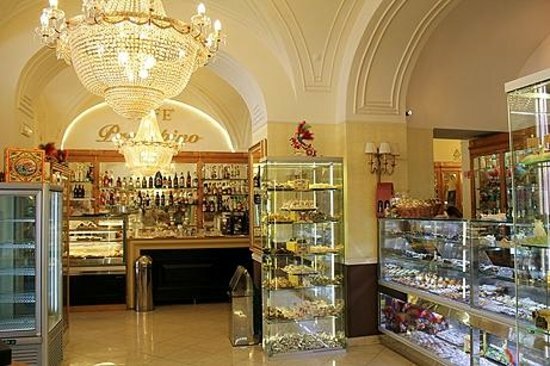 The main reason to come to Prestipino are the pastries and gelato. The choices are myriad. Cannoli, baba rum, and cookies were our choices, but there are many more, and all were excellent. Thank you, although to be truthful, this time, most of the photos are not mine. Again,great info to keep in mind for future travels. And now I'M hungry again!